Taking the title of Susan Sontag’s seminal work as a starting point, this workshop aims at re-opening an old debate about the potentialities of exhibiting other’s suffering in order to promote a culture of peace, prevent war and/or resolve conflict. Sontag concluded in her book that images of atrocities had led the Global North to a form of exhaustion, also called compassion fatigue, which has been criticised more recently as a myth. Yet, images remain today the main strategy of humanitarian organisations to raise awareness and funds. 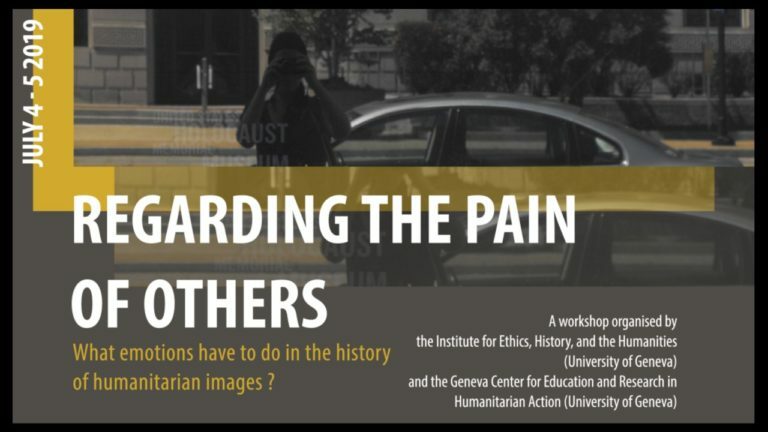 In this workshop we would like to propose considering the importance of images (not only photographs, but also drawings as well as motion pictures) within the long-term history of humanitarianism, in order to explore the role of emotions in shaping and mobilising public opinion. More particularly, we encourage scholars to think about the ways through which humanitarian images affect us as material objects that have expressive effects related to the circuits, places or circumstances in which they are exhibited. This perspective gives us the possibility to read humanitarian images as cultural, social and political practices implemented by actors (individual or collective) in a specific historical context. By engaging emotions with images, we seek to understand what they have done in the history of humanitarian relief, rather than merely looking at the meaning of their visual representations. For all speakers who are invited to present papers at the conference, the organizing committee will cover the travelling and accommodation costs. To download the Call for Papers or for more information, please visit the original BMJ post here.